Happy New Year to you all, lets get on with some training shall we? The old masters taught that all training occurs in transitions and as I have advocated many times, without doubt, transitions can be used to improve balance, suppleness and obedience. But correct transitions are not easy. It is important at all times that you think of the downward transition as upwards! I see many riders allowing their horses to ‘flop’ or ‘fall’ into the downward transition. Some horses fall heavily to the forehand and then eventually change gaits, others simply like to quit and put very little effort into supporting their weight from the hind end. Ideally, the energy should be maintained with the same fluidity from say, canter to trot or trot to walk. Think about your upward transitions and how you ask for them – do exactly the same on the downward transition but with a resisting hand. 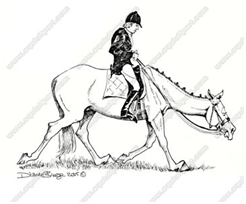 You must push the horse forward so that the hind end comes under, indeed you may need to use a little MORE leg in the transitional strides to encourage your horse forward. Timing is very, very important and when you practice or are training your young horse, don’t be discouraged if the horse will not make the transition and continues to canter if you are asking for trot, simply persist with the forward encouragement of the seat and leg, but resist with the hand. That is, block with the hand (do not pull back) simply stop allowing with the hand and eventually, your horse will respond with a forward transition that is fluid and energetic. You should always be looking up and to where you are going in the downward transition. Too many riders look down and bury their horses into the hole they create in the ménage. Likewise you should ensure that in your mindset you are ‘A Back to Front Rider’ concentrating all your efforts on engaging the hind legs and not focussing on the front end. There are a couple of previous posts that will aid your downward transitions if you apply their principals. The first is about Canter departs … Up, Up and Away and the second about rider contact issues … A Back to Front Problem. Both of these posts will give you information to aid your downwards transitions, although they are not specifically about the subject. So, how do you recognise a ‘less than perfect’ transition? Well the horse will hollow it’s back, his head will come up, his weight will be shifted to the forehand, you will feel a loss of rhythm and energy. It will not feel seamless. This may be because you have not prepared properly for the transition or you may be leaning forward; your rein aid may be too strong (pulling); you may be leaning back. You may not have prepared the preceding gait sufficiently well. As with most things Dressage ,good begets good! 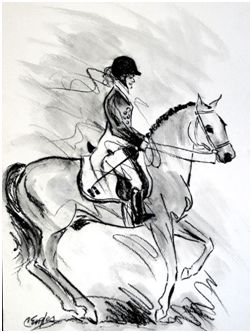 If the canter is on the forehand, so the transition to trot will be … and so on. In dressage, transitions are the most marked and commented upon part of the dressage test. Put as much effort as you can into perfecting them and don’t be discouraged if you can’t get it right away. Instead, practice the ‘flow’ at every opportunity and soon enough, you’ll notice that your horse is not getting stuck in his downward transitions. If he is, then as always, take him back to rhythm and relaxation before you begin to try again. I love that analogy. I have always taught people to think of transitions as a circle. Continuous, no seams just constant fluidity up and down. I have just begun collected work with my mare just one to two days a week. She is bright and it’s already taking root. So exciting I have to remember to not look for too much too soon. Transitions are the glue that keeps everything together. It is joyous when you do begin to feel it become embedded in the work. Try some trotting poles on the long side of the arena. Canter, ask for trot transition before the poles, trot the poles and back into canter. Your horse will come to expect the poles and will think about lifting over them and begin to be more ‘UP’. Once you have done this a few times reduce the number of poles you use until you don’t need them. But I will definitely give that a go a few weeks (or months, depending how long it takes for her to calm down!) from now, it makes perfect sense, and I am already imagining how to ride it. I have loved reading these articals, what an eye opener. there is something of use in each and every topic you have written about. Thank you. Hello! I wish to thank you for your great advice. For 20 years I rode every day, sometimes twice a day, 365 days a year. I rode every horse that was available and I half-boarded or full-boarded others. Then I took 21 years off riding to travel the world. I was fortunate to find work that allowed me to take chunks of time off to do so and I took full advantage. Now I’m back in the saddle. I half-board a thoroughbred gelding who is a sweetheart and ride him 3 times a week. And it is like starting from scratch! I can’t sit to him well, I can’t canter without falling forward, my legs too weak, my hands too strong ….and on and on. Nonetheless, I’m determined to “re-learn” with the hope I can recapture that euphoric feeling of balance, harmony and smoothness I used to know on those long ago rides. I am taking one lesson per month for the time being. After reading your article on “dependence” I decided to work mostly on my own whilst applying the precious advice I glean from your site. Thankfully, my horse is very forgiving and patient! Thank you, Patricia. Your advice re. no stirrups was invaluable and I can report my first semi-decent ride in quite some time. Oh, and I sang a song too!